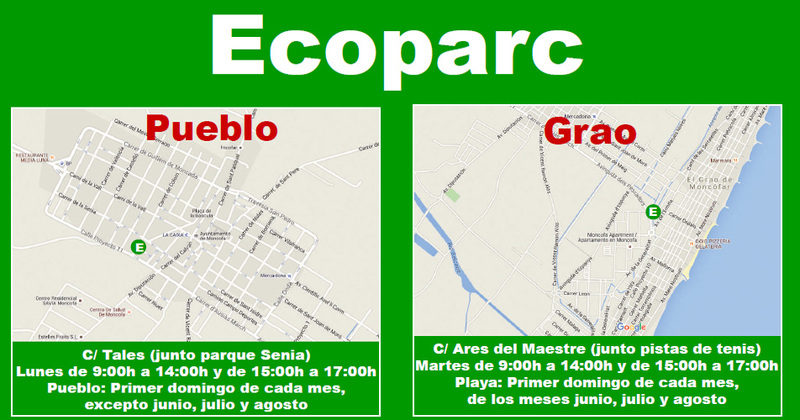 The City of Moncofa relocates its eco-park. The intention of the corporation is to promote the collection and recycling of household products. Recall that the eco-park is a facility separate collection and storage where citizens can bring household waste (except those that are organic) and place them in suitable containers. According to the mayor, Wences Alós, “with the new location of the ecoparks, one day in the village and another on the beach grao, it aims to promote the separate collection and proper management of our urban waste”. Going through the ecopark allows valorize, ie, provide them with value by leveraging those materials that can be directly recycled. Thus saving raw materials and energy is achieved, while avoiding uncontrolled dumping and the amount of waste disposed in the landfill is reduced. The new locations will be effective from Monday 25 July and are Mondays parkside the Senia and Tuesday next to the tennis courts (in grao).